Mount-It! 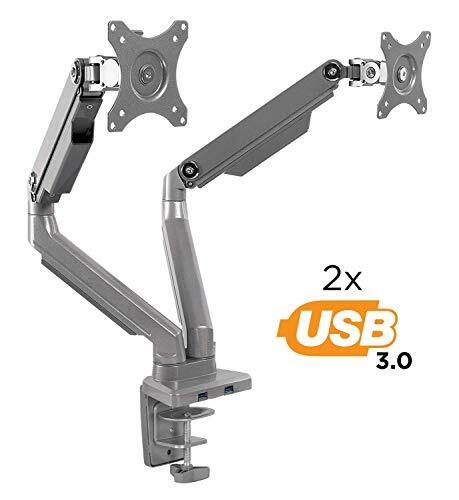 MI-2762 is the ultimate dual monitor desk mount. It comes with full motion capabilities to enhance the use of dual computer monitors. Dual monitors are ideal for increasing your productivity as they display twice the information without having to switch between applications. However, two large monitors can take up much of the desktop space. With this dual arm monitor desk mount, you can elevate both monitors to open up tabletop space, while also improving your posture. Poor ergonomics with incorrect monitor height and angle can result in back and neck pain. FEATURES AND SPECIFICATIONS: VESA 75x75 and 100x100 compatible. Fits all monitor brands with VESA patterns. Use for monitor sizes 19, 20, 21, 22, 24, 25, 27, 28, 29, 30 and 32 inches. 2 x USB 3.0 ports for easy connection of your devices. Mechanical spring arms offer fingertip height adjustment of 11.5 inches. Spring tension is adjustable to suit the weight of your monitors. Weight capacity: 4.4 to 17.6 lbs for each arm Tilt: 90 degrees up / 90 degrees down Swivel: 360 degrees at two joints and 180 degrees at one joint Rotate: 360 degree (between landscape and portrait modes) Desktop thickness: 0.39-3.3 inches C-Clamp and Grommet base options included. Quick-disconnect VESA head allows easy removal of monitors. Premium Aluminum and Steel materials for sleek look. Cable management on the arms. Works with curved monitors. DUAL MONITOR STAND with height adjustment and full motion arms helps clear your desktop, improve productivity and ergonomics. UNIVERSAL FIT for all monitor brands. VESA compatible with 75x75 and 100x100 configurations for monitor sizes 19, 20, 21, 22, 24, 25, 27, 28, 29, 30 and 32 inches. DUAL USB 3.0 PORTS provides convenient device connection to your computer. Cable management offers neat and clutter-free desktop.